In light of a deadly incident last year at Mount Everest, Nepalese guides have charted a modified route to reduce avalanche risk. Trouble is, it will expose climbers to some extremely challenging – and potentially deadly – terrain. 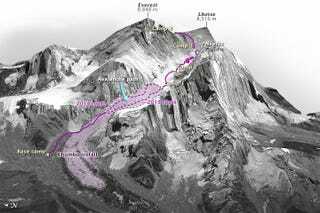 On April 18, 2014, a block of ice weighing as much as 657 passenger buses fell nearly half a kilometer, triggering a deadly avalanche that killed 16 guides. It was the single deadliest day in Everest’s history. On that fateful day, the guides were following a popular route along the far northern edge of the icefall. This minimized their chances of getting hit by ice, but it exposed them to the steep slopes of Everest’s western shoulder, thus increasing exposure to a potential avalanche. Going up the center is no safer, as collapsing seracs — massive blocks or columns of glacial ice — are common. The best option, say the Nepalese “Icefall Doctors,” is to hike along the northern edge. This will reduce avalanche risk, but it will expose climbers to chaotic terrain, including gaping crevasses and extremely dangerous — and potentially deadly — towering seracs. As long as glaciers exist on Everest, crevasses and ice falls are always going to be a feature of the landscape. Snow avalanches, likewise, occur with or without climate change, and in fact they will surely occur after the glaciers disappear completely. However, with climate warming and the glaciers thinning, we can expect that ice avalanches and rock avalanches will occur in spots where previously they did not. Read more at NASA’s Earth Observatory. Image credit: Gregory Leonard, University of Arizona, based on ASTER GDEM2 and data provided courtesy of Digital Globe and Mark Fahey at the U.S. Geological Survey.